Not too long ago, the Baron and I dined at a few steakhouses where we've ordered the calamari on the menus. 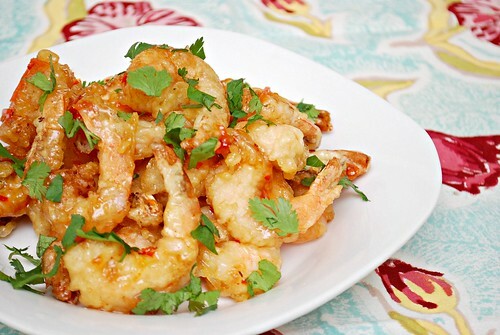 Most, if not all, were fried in a light batter and then tossed in a sweet and spicy sauce. Using that as inspiration, I tried to do the same with shrimp... and I think I prefer the shrimp version over calamari! There's something about the sweetness of the sauce that has a hint of spice. Not to mention how great the textures of something crunchy yet firm. The best bonus [for me at least] is that it's gluten free and the use of white rice flour really gives a nice crisp coating on the shrimp. This is especially good with steamed rice and vegetables. Heat oil to 325 degrees in a dutch oven. Use a candy thermometer to measure the temp. Meanwhile, combine the flour and seasonings in a bowl, whisking together. Slowly add the cold seltzer water to the bowl, continuing to whisk to form a batter. Dip the shrimp into the batter, allowing excess to drip off and them immediately place in the hot oil to fry. Fry until golden brown and transfer cooked shrimp to a plate lined with paper towels to drain. Transfer tempura shrimp to a bowl and add the Thai chili sauce, tossing to coat. Place coated shrimp onto a serving platter and garnish with cilantro leaves. I don't like fish, but I love shrimp!